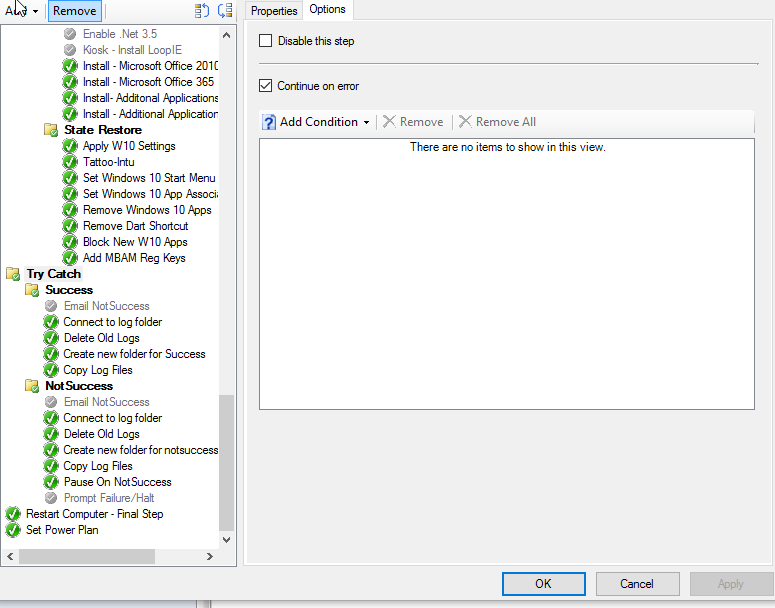 Following on from my post last year Building a Clean Windows 10 Reference Image – MDT 2013 U1 this entry will go rehash over some of the same steps that were discussed there as well as additional steps to deploy Windows 10 1607. From here i will assume you have all of the above running however you do not need to be on the latest SCCM version (1606) for these, you will however want to have the ADK and MDT up to date. 2. Watch this video from the 8:00 till 13:20 to learn how to tweak CMTrace.exe and SMSTS.ini to bolster your OSD experience. https://youtu.be/HtvDHs5NCPw?t=481 , once you have done this go back and update your deployment share and continue with Johans Post. 1. Check out my post here on how you can leverage DART for dynamic remote control for your OSD builds. 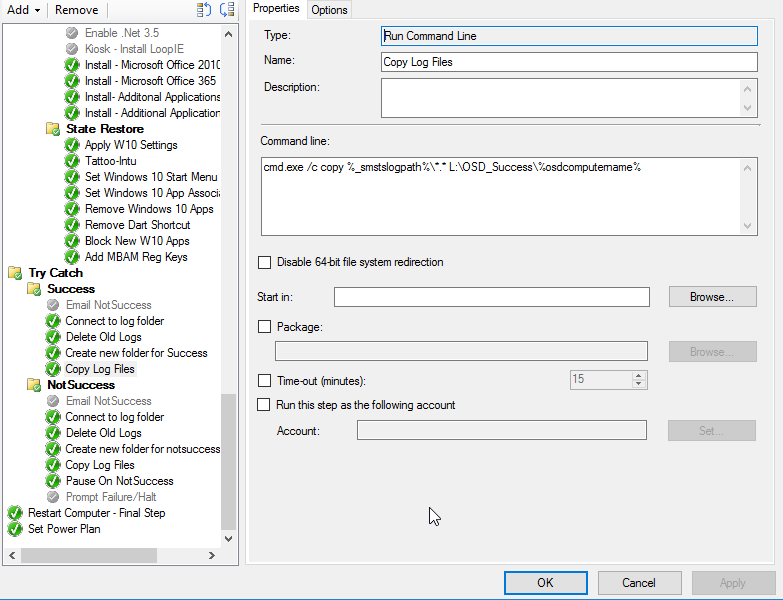 There is a reason i am not using a folder named “OSD_Failure” – each time CmTrace detects the word “fail” in your SMSTS.log file you will see an “error” which in this case is just the name of the step, so to make your logs nicer to read, avoid using the word “failure” wherever possible. Place these files (tweaked to your liking) in a share in SCCM sources folder and create a package (with no program) . This package will be called upon multiple times during your task sequence. 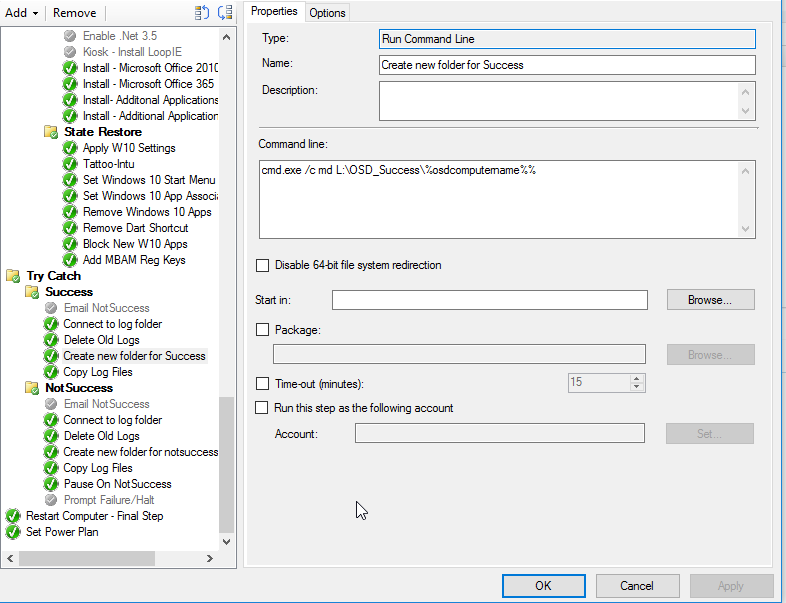 Log onto your SCCM box and open Windows System Image Manager. From here you can modify your unattended as much as you like, here is mine.. with some info redacted. Note: <Logo>c:\windows\media\COMPANYLOGO.bmp</Logo> . This file is being copied to my WIM during my reference image creation.This will allow you to show your logo and in windows “system” page. 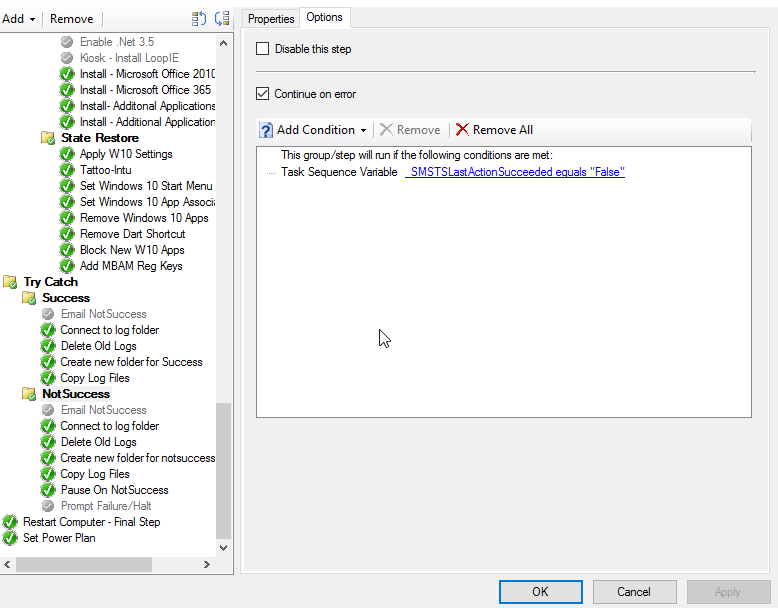 Create a new TS (with MDT integration) and add the following steps. Set the following 3 Variables at the beginning of your TS. Why: Will force reboot instantly after each step to 0 seconds. Improves TS time. Here we will add logic to do a Try/Catch for any errors. Copy these steps changing for your own folder names. Previous Post Suppress Office 365 "First Things First"
Any chance you will be uploading the removeapps2.ps1 ? Great guide nevertheless! What does the tattoo step actually do? Needed for? The script mentioned for removing apps isn't in the Scripts Share OneDrive – can you publish that? Add step to Tattoo the registry……….. Task Sequence failed to run these command lines. If I run it single one by one command line then it does create the registry key though. Anyone successfully run multiple command lines by inserting & ? thats an exact copy of mine (Company name changed) – this works without issue, try it again ? All of the variables listed must exist. Thanks for replying. I've tried again but still failed. 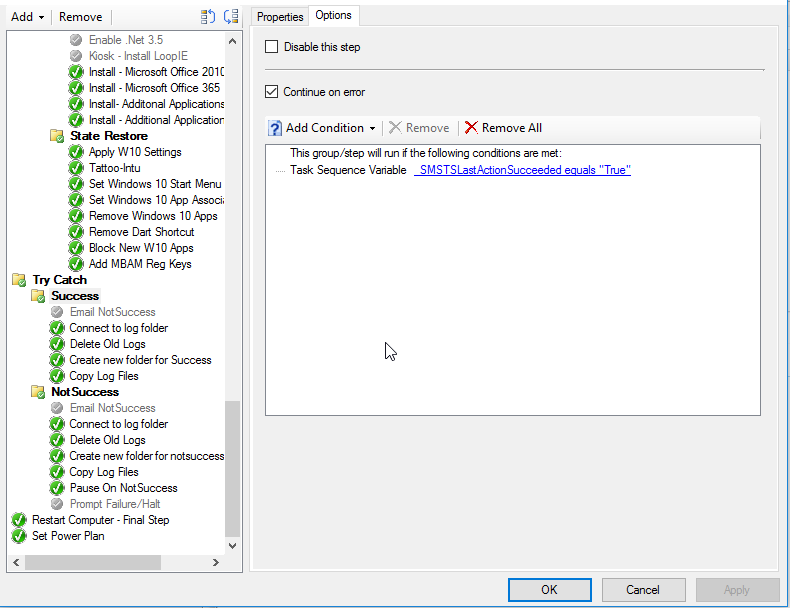 I have SCCM 2012 R2 SP1 with MDT Integration in my company and not sure if that causes the issue. Adding single command line and it works though.